Smackdown General Manager Paige has announced a grudge match for Smackdown this Tuesday. 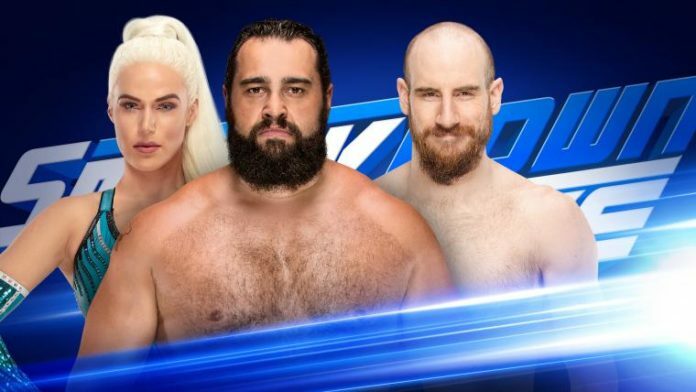 On the 1001st edition of Smackdown Rusev and Aiden English will face each other in single’s competition. It will be the first time the two former tag partners have faced each other on the main roster. In 2013, they wrestled twice on NXT house shows with Rusev winning both matches. The team formerly known as Rusev Day teamed up originally in October of 2017. They were defeated by Randy Orton and Shinsuke Nakamura on an edition of Smackdown. Rusev Day wrestled twice for the Smackdown Tag Team Championships, coming up short both times. They wrestled in a fatal 4-way tag match for the titles at Clash of Champions 2017. That match was won by the Usos. Their other tag-team title opportunity was also their last match together as a team. They lost to New Day on the 2018 Hell in a Cell Kickoff show.